Kappy woke grumpy the next morning and her mood only grew darker as the morning wore on. It had rained the night before, not one of the intense thunderstorms that often blew from the plains, but a steady drizzle that had made the night miserable and the morning cold and uncomfortable. The rain stopped before the sun rose, but water still dripped from everything. Miles was tired and shivering and didn’t feel like talking, which was probably for the best considering Kappy’s mood. They’d packed up in silence, Kappy not even acknowledging Miles’ presence. He’d shaken out the tarp they’d used the night before to keep the rain off and tried his best to dry it before he rolled it up and tied it onto the tractor along with the rest of the sleeping gear. Kappy’s bad mood was solidified when her tub refused to start. Miles was just grateful it wasn’t his vehicle that had stopped working as he was sure Kappy would have left him again. Since she couldn’t abandon herself, she spent an hour and a half on her back in the mud hammering around on the inside of the tub. Miles had offered to help, but Kappy ignored him. Kappy finally pulled herself out from under her tub and stalked around the vehicle, her face dark and angry. She gave the tub a hard kick and then reached inside and pulled out a few more tools. Miles sat on his tractor and watched as Kappy began removing panels from over the engine. Kappy’s outbursts of frustration were so silent that Miles would have found them funny if he wasn’t so worried she was going to force him to leave. He was also keeping a nervous eye on her rifle which was poking ominously over the edge of the tub. It took another hour before Kappy found the problem. “I just replaced you!” she shouted as she hurled the offending bit of metal into the bushes. “Hey, don’t do that!” Miles shouted as he jumped off the tractor and went to retrieve the piece. “It’s defective! It’s already completely rusted through!” Kappy kicked the tub again. Miles arms were soaked as he pushed aside the leaves looking for the part. He found it at last and picked it up from among the wet brown leaves that covered the ground under the bushes. He held the rusted piece of metal out to Kappy. She took it with a glare and stomped over to Miles’ tractor and rummaged through the baggage. She found it, tore it open and started mending the piece. Miles watched as she chipped away the worst of the rust before selecting a piece of patch metal. She wrapped her hand in her shirt and held the engine piece while she removed the plastic covering from the underside of the patch metal. It glowed brightly red for a brief moment as the metal melted. Once the color had faded Kappy tapped the patch with a finger and then shook the part a few times to make sure the seal was good. Satisfied at last, she tossed the repair kit back under the steering wheel and returned to the dismantled tub. Miles edged around her to his tractor and repacked the repair kit before putting it away again. “How do you know there’s a stack near here?” asked Kappy from inside the engine. Miles was silent and Kappy glanced at him. “Someone you knew?” she asked finally. His voice trailed off and Kappy finished putting the tub back together in silence. When the last piece was back in place she stoop upright, placed her hands in the small of her back and stretched, her eyes squeezed shut. Then she shook herself and tilted her head, listening. Miles pointed up over a nearby ridge and Kappy closed her eyes once again, concentrating. “What are you looking for?” asked Miles. The tub protested as Kappy tried to start it, but eventually it coughed to life and the two rumbled off down the main road. They took the first side road they came to and twisted their way up the ridge. The clouds were finally beginning to clear around noon, just as Kappy pulled her tub to a stop at the top of the ridge and looked out over the valley. A patchwork of forests and fields lay before them and the valley was hemmed in on both sides by steep mountain cliffs. 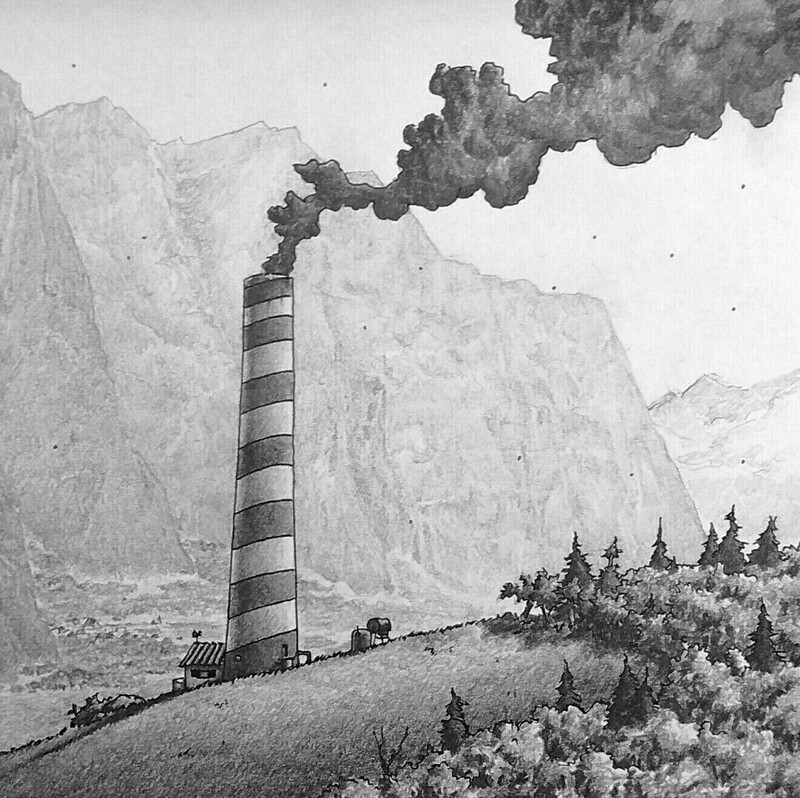 The Rust initiative’s smoke stack rose from the center of the valley looking like a bleached candy cane. It was quite large, even from this distance, and painted with white and red stripes that rose in a spiral around the cylinder of the chimney. Black smoke drifted from the mouth, staining the top of the stack a dirty yellow. The rooftops of the little town of Washerwoman could just barely be seen beyond the canopy of trees. “We’ll get down there and check if anyone’s at the station, then I’m leaving. You can stay and visit if you want,” said Kappy, starting down the trail. They could smell the smoke as they approached the tower. The acrid smell hung in the air despite the breeze blowing across the hills. It clung like oil to everything, the bark of the trees, the stones of the mountain, the entire valley was saturated after years of exposure to the corroding fumes. Tiny floating black specks could be seen drifting through the air, slowly succumbing to the pull of gravity. The red and white stripes of paint running up the stack were years old and the red had paled and was nearing pink on the side of the structure that was exposed to the most sunlight. The tiny station office was boarded up and very empty. Miles half-heartedly pounded on the door, but Kappy was already heading back towards the ridge.